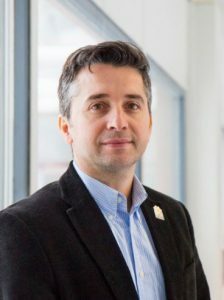 Mircea GUINA obtained the PhD degree in physics at the Tampere University of Technology, Finland in 2002. He is a professor of optoelectronics since 2008 and leads the Optoelectronics Research Centre team at the Tampere University. He conducts research on molecular beam epitaxy of novel optoelectronic compounds, development of semiconductor lasers and solar cells, photonic integration, and use of lasers in medicine and LIDAR. He has published more than 180 journal papers, several book chapters, and holds four international patents. He is co-founder and Chairman of Reflekron Ltd and Vexlum Ltd. Prof. Guina is a Topical Editor for the Optics Letters, the Journal of European Optical Society, and a recent recipient of OSA Fellow and SPIE Fellow distinctions.